With the plethora of new sports card products releasing each month, it can be hard to track down your favorite player's card or that key item to complete a set. 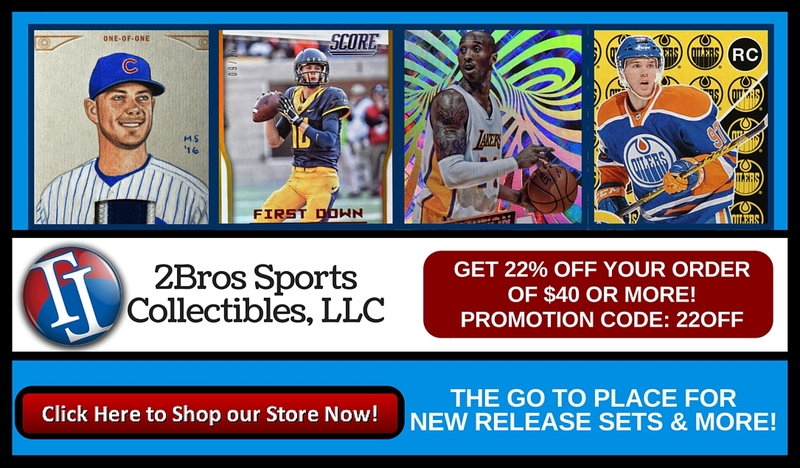 If you're looking for an online shop that has a large inventory of the top new products and makes it easy to find what you're looking for in your collection, then pay a visit to 2Bros Sports Collectibles. Owned by brothers Todd and Tom Hallada, 2Bros separates themselves from other options based on their large card inventory. "Completing your set at a one-stop location is possible here! Because we are opening as many as ten cases of each set, our selection can be astronomical compared to other dealers. This is especially true with base cards, parallels, and inserts. If you want between 20-50 cards of your favorite player, you have a good chance of finding that here. Furthermore, our selection of premium cards is also rapidly expanding, and there are hundreds of one-of-a-kind collectibles in our store." A classic family business, 2Bros started out 12 years ago with the two brothers buying a couple packs at Walmart and listing the cards on eBay. What began as a hobby quickly became a part-time business. A little over a year ago, the brothers took the plunge and committed to this exciting endeavor on a full-time basis. Besides the selection of cards, which as noted above is quite extensive, there are two other main reasons 2Bros believes their store should be your go-to source. Recognizing the legitimate options that are out there, 2Bros set out to be highly competitive with both price and service. Because of their ability to purchase in bulk, this allows them to offer cards at lower prices than other dealers, and they will even entertain best offers. Additionally, they pride themselves on customer service, rapidly responding to inquiries and providing prompt shipment of cards on the next business day. As a way to promote their amazing inventory and get new customers on board, 2Bros is offering an introductory discount of 22% off for orders of $40.00 or more. Click the banner below and you will be redirected to their landing page where you can browse a multitude of new release products now available in their online store. Make sure to use the coupon code 22OFF at checkout.